"Catherine's book Dialogue contains four treatises—her testament of faith to the spiritual world. She wrote: "No one should judge that he has greater perfection because he performs great penances and gives himself in excess to the staying of the body than he who does less, inasmuch as neither virtue nor merit consists therein; for otherwise he would be an evil case, who for some legitimate reason was unable to do actual penance. Merit consists in the virtue of love alone, flavored with the light of true discretion without which the soul is worth nothing." In 1378, the Great Schism began, splitting the allegiance of Christendom between two, then three, popes and putting even saints on opposing sides. 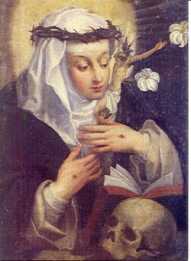 Catherine spent the last two years of her life in Rome, in prayer and pleading on behalf of the cause of Urban VI and the unity of the Church. She offered herself as a victim for the Church in its agony. She died surrounded by her "children" and was canonized in 1461.